The Federal Motor Carrier Safety Administration (FMCSA) knows how important safety is in the commercial truck driving industry. Safer carriers don’t just present less of a hazard on the roads – they’re easier to work with. If a company has a good record of safety, they’re less likely to experience things like accidents that can damage freight or delays that throw schedules off. But how can you truly know just how safe, or unsafe, a company is? The FMCSA offers a metric that can potentially help with this. What is the FMCSA Safety Measurement System? How does it work, and why should you take note of it when you’re looking for freight transportation services? Safer carriers often do better business and can be easier to work with. The safety measurement system (SMS) is useful for discovering danger so authorities can intervene before a serious issue arises. The SMS uses data from three primary categories to make calculations about the safety of carriers. These categories include findings from routine roadside inspections, crash reports from the last two years, and data from any investigations. Under the SMS, carriers receive a score, which is updated once per month, and divided into seven categories, known as Behavior Analysis and Safety Improvement Categories (BASICs). Unsafe Driving: Accounts for repeated unsafe behaviors like speeding, texting, and inattention. Crash Indicator: Includes data from state-reported crashes from the last two years. Hours-of-Service Compliance: Addresses any violations that see drivers staying on the road past federally regulated hours, thereby ensuring drivers remain awake and alert. Vehicle Maintenance: Includes pre- and post-trip inspections, repairs, and vehicle defects. Controlled Substances/Alcohol: Addresses issues of intoxication from illegal drugs as well as alcohol, over-the-counter medication, and prescription medication. Hazardous Materials Compliance: Includes any issues with the packaging, loading, unloading, or transport of hazardous materials. Driver Fitness: Accounts for any driver fitness issues that would put them at odds with current standards. There’s even an equation to determine performance measures, and carriers are measured against those with similar scores when making these determinations. The equation is the average power units multiplied by the utilization factor, then taking that product and dividing it into the sum of total weight. 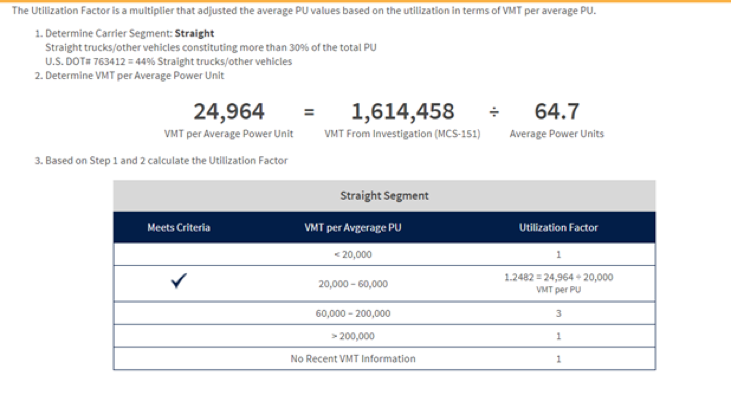 To calculate the utilization factor, take the vehicle miles traveled from investigation data and divide it by average power units. As we can see, the FMCSA is pretty rigorous when it comes to calculating safety scores. And while a negative score doesn’t exactly mean a carrier is blacklisted from business and a danger to the motoring public as a whole, there are benefits in choosing carriers with higher scores. What Is the FMCSA SMS’s Benefit to Customers? What is the FMCSA Safety Measurement System? It’s a metric that provides data-based findings with public input to rate carriers with accuracy. Clients of transportation companies are just like the clients for any other industry – they want the best experience. This means avoiding problems and unforeseen difficulties. And while every freight company may have their own pricing system and rates, there is no denying that safety concerns represent a big financial liability. When a company has a better safety score, they’re less likely to experience accidents or delays. If you trust them with your freight, you know you’re more likely to get deliveries on time and ensure your cargo arrives safely. The SMS isn’t just about protecting the roads – it’s about protecting the customers of the transportation industry.